I was extremely excited to have the opportunity to recently review an all-new CGI animated series released. Care Bears: Totally Sweet Adventures became available March 5, 2013 from Lionsgate Home Entertainment on DVD, Digital Download and Video On Demand. 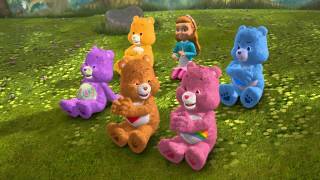 "The Care Bears embark on all-new exciting adventures with a fresh new look, new attitude and all-new music. These lovable Bears premiered on The Hub TV Network in June 2012 and garnered over 6 million unique views." The synopsis says "Ride the rainbow to Care-a-Lot and join Share, Cheer and all their buddies in four exciting new adventures! Whether it's teaching a new friend how to find her courage against the sneaky Beastly, bringing sweetness back to Sweet Dreams Bear's bad dreams, or helping Grumpy get unstuck from"Stick-'Til-You're-Stuck" sand, the Bears are always there for each other! And when Share gets jealous of Grumpy's delicious cookies at her potluck, get ready for a bear bake-off bonanza in these delightfully sweet tales for a new generation!" As a little girl growing up I always loved the care bears but even into my adult years I have always found myself drawn to the bears for different reasons (ex. the clover bear in Irish pride). So when I heard they were releasing an all new version re-created with CGI animation, I was excited to share these lovable guys with my boys. The boys loved the graphics and both seemed very interested in the sing alongs! After watching this several times with each of them I think this is going to end up a family favorite! The best part is this is geared towards both boys and girls so Dane can watch it with all his little girl friends! Recommendation: Both boys really liked this and it was finally something I could enjoy with them unlike all the other crappy cartoons they tend to watch. Declan really liked dancing along to all the songs. I think the colors and music is great for most any age and the price is pretty reasonable for this type of movie.